Ray has crossed the Thin Blue Line. How long before he gets a Bullet in the Face like Frank Serpico did remains an open question. I think we will see much more of Cpt. Ray Lewis. The action is heating up in NYC after the Grand Jury did not indict Eric Garner's Murderer. A retired Philadelphia police captain, Ray Lewis, has told the truth about the role of law enforcement in America. “It’s an oppressive organization now controlled by the one percent of corporate America. Corporate America is using police forces as their mercenaries,” Lewis said during a recent interview. Mr. Lewis underscores the fact police have never served the public and are acting at the behest of fascist corporations and banks, the very institutions that have controlled the nation and ruled over its political system for decades. Banks used mercenary cops to wipe out a misguided and muddled Occupy movement when it went after Wall Street. Homeland Security, supposedly designed to combat an illusive terrorist threat, coordinated the government response that ultimately destroyed the movement. 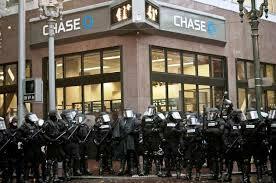 JP Morgan Chase, one of the largest bankster operations in the world, showed its gratitude when it donated $4.6 million to the New York police. If the Ferguson movement sincerely wished to end mercenary cop violence and brutality it would expose this connection between the corporate state and the police. As McElroy notes, the concept of an organized and tax payer funded police force was first introduced by the British in 1786 in Dublin for the explicit purpose of quashing what the state considered disorder. “In this as in other social measures, Ireland acted as a testing ground for what would later become policy in England,” McElroy writes. “The modern policeman is, in fact, the antithesis of Marshal Dillon and an expression of the stereotypical British sheriff — a civil servant responsible only to government and governmental policy,” she adds. The United States Constitution initially prevented the federal government from controlling state and local law enforcement, but this has changed over the last few decades as a centralized federal government has incrementally exercised its monetary influence over police, especially after 9/11. Unwittingly or not, the activists and protesters in Ferguson are creating a situation that will ultimately result in a strengthening of mercenary police control over the citizenry. By engaging in criminal activity – much of it, such as looting, praised by white intellectuals – and promoting discord and violence along racial lines, the activists are forcing average Americans (who are denigrated as racists) into a position where they will ultimately demand police protection, although, as McElroy and others have noted, that protection is at best illusory. Short of comprehending the true nature and role of mercenary cops – the protection of a corporate-fascist state and, most importantly, as a weapon against organized opposition – the Ferguson activists and their followers are playing right into the hands of the state. Re: A Modern Day Frank Serpico: Captain Ray Lewis Stands Tall! Have actually met Ray Lewis on some direct actions. Seems the real deal-- a very humble man with a keen sense of right and wrong. Nimmo seems to have the lay of the land correct as well. NYPD patrol car. Image via Agence France-Presse. While a Staten Island grand jury decided on Wednesday not to indict the New York City police officer involved in the death of Eric Garner, prosecutors were able to secure an indictment against the man who filmed the fatal encounter. As the Staten Island Advance reported, 22-year-old Ramsey Orta was indicted this past August, 13 days after being arrested and charged with felony counts of third-degree criminal weapon possession and criminal firearm possession. Orta had two other cases against him pending at the time of his indictment, including charges of robbery and hitting a man who was collecting bottles outside his home.